by: Amy Zuckerman and Jim Daly, illustrated by: John Manders - (Dutton, 2009) 32 pages. A talking dog, a housecleaning robot and a three-dimensional “data orb” are among the many cool features that kids might enjoy in the future, according to this lighthearted look at 2030. The breezy narrative follows one boy through a typical day, highlighting many interesting aspects of his world. Fanciful cartoon drawings show a lively and appealing world full of new and intriguing activities that correspond neatly to modern equivalents. Schools are now made from plasticized blocks that snap together, for example, while recess features virtual batting practice and a “smart trampoline.” Recreational activities include magnetized hovering skateboards and a virtual-reality “Fanta-trek Center.” Some social changes are briefly noted, such as new career paths and the increase of marriages between different ethnicities. Interaction with the natural world is not mentioned, although many of the new technologies have eco-friendly components and the food is all meatless and delicious. 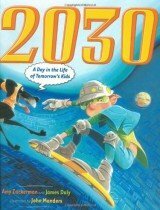 Find 2030: A Day in the Life of Tomorrow’s Kids at your local library. by: Russell Hoban, illustrated by: Lillian Hoban - (Harper & Row, 1969) 32 pages. Frances can’t imagine being friends with her little sister Gloria until she is excluded from the all-boys baseball game. To her surprise, Gloria makes a good friend, but can she ever be a best friend? If your child enjoys this book, introduce her to other stories in this series including A Birthday for Frances. Perfect for: Kids who like making friends. 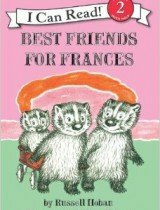 Find Best Friends for Frances at your local library. by: Patricia MacLachlan - (Harper & Row, 1988) 144 pages. Minna grows up with some odd friends and relatives. MacLachlan’s stories are a rarity in today’s children’s books — simple, gentle tales of children who manage to be reasonably nice kids without being insipid. Minna Pratt is an amazingly delightful book, a book that makes you smile all through it, a book that makes you want to know all of the characters in real life. 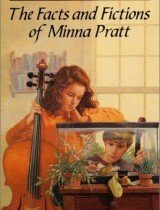 Find The Facts and Fictions of Minna Pratt at your local library. by: James Marshall - (Houghton Mifflin Company, 1972) 48 pages. 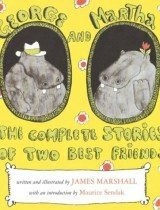 George and Martha are two hilarious hippo friends who invariably get themselves into sticky situations. Your child will love finding out what happens when George does not like the split pea soup that Martha has made for him in “Split Pea Soup,” just one of the five humorous stories in this collection. Find George and Martha at your local library. by: Jan Brett - (Putnam Juvenile, 2000) 32 pages. Henny wants to raise little chicks, but an elf keeps stealing her eggs before they hatch. Your child will be surprised to learn how her friend Hedgie helps Henny scare off the bothersome elf once and for all. Make a special point to draw your young child’s attention to the nearly hidden pictures that border each page of this book. 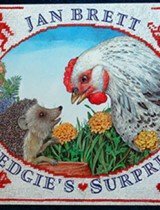 Find Hedgie’s Surprise at your local library. by: Ezra Jack Keats - (Harper & Row, 1968) 32 pages. In this classic book about friendship, Peter has a falling-out with his friend Amy. Peter fears the worst — that Amy will not come to his birthday party. Children will relate to this story’s themes, and Ezra Jack Keats’s collage illustrations will intrigue children and parents alike. 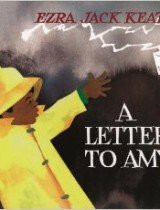 Find A Letter to Amy at your local library. by: Janell Cannon - (Harcourt Brace Jovanovich, 1993) 46 pages. The hook: Stellaluna is a baby fruit bat happily flying along with her mother when an owl attacks. The poor little bat is knocked out of her mother’s grasp and lands in a birds’ nest. The mother bird accepts Stellaluna as long as she acts like a bird, not a bat. Soon enough, Stellaluna learns to eat bugs and stop hanging by her feet. When she finally has a chance to show her bird siblings, Pip, Flutter and Flap, what life as a bat is like, they are left all in a muddle: “How can we be so different and feel so much alike?” one asks. Anyone who has ever been in a position where they can’t be who they really are will relate to Stellaluna’s predicament. Cannon’s award-winning illustrations convey the nocturnal world beautifully. Readers will be enchanted by this book with its messages of acceptance, friendship and a mothers’ love. Want to see the movie? The 2012 animated adaptation fleshes out the picture book with additional characters and songs while staying true to the story. Find Stellaluna at your local library. by: Florence Parry Heide and Sylvia Van Clief, illustrated by: Holly Meade - (Candlewick, 2003) 40 pages. Theodore, the lumbering elephant, hurts his leg so badly he can’t walk to the edge of the forest to meet his cousin. Will his friends’ advice help him solve his problem, or does he need something more? 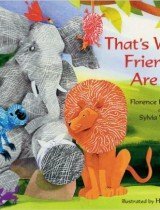 The collages of painted paper and repeating text pattern will make this reprint of the 1968 classic one of your child’s favorites. Find That’s What Friends Are For at your local library. by: Jane Yolen and Heidi E. Stemple, illustrated by: Philippe Beha - (Crocodile Books, 2006) 197 pages. Jane Yolen retells familiar fairy tales in a brief and lively style, while her daughter, co-author Heidi Stemple, pairs them with at least one kid-friendly recipe that connects with the story’s theme or references. For example, “Cinderella” is presented with a recipe for pumpkin tarts, while “The Runaway Pancake” is matched with, of course, a recipe for pancakes. The tales are divided into four sections: breakfast, lunch, dinner and dessert. The colorful illustrations add to the fun, and margin notes provide additional information on main ingredients and the stories and their origins. Adult supervision will be necessary for completing the recipes, but this book would be a great way for the whole family to share a reading and eating experience. Perfect for: Kids who like to cook. 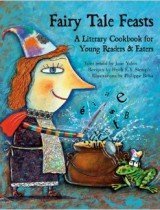 Find Fairy Tale Feasts: A Literary Cookbook for Young Readers and Eaters at your local library. by: Marjorie Priceman - (Random House, 1994) 40 pages. A young baker travels the world to find the finest ingredients for her apple pie. On her journey, she introduces the reader to cultures and products from around the globe. After the raw ingredients are prepared for the pie, the baker invites children from around the world to share it with her. The recipe is included at the end of the book. 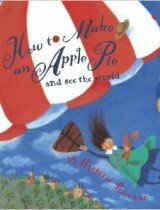 Find How to Make an Apple Pie and See the World at your local library. by: Andrew Clements, illustrated by: Brian Selznick - (Simon & Schuster Books for Young Readers, 1996) 112 pages. When clever yet precocious Nick decides to invent a new word for pen, it puts him at odds with his no-nonsense teacher, a stickler for grammar and proper word usage. 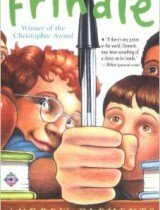 What begins as a classroom duel over the usage of the word “frindle,” escalates into a national word craze. Perfect for: Kids who like realism. Find Frindle at your local library. by: Brian P. Cleary, illustrated by: Brian Gable - (Lerner Publishing Group, 2004) 32 pages. This book tells a story in rhyme, using different types of pronouns, leading children to become more apt to remember what pronouns are. The colorful illustrations feature funny monster-like creatures taking part in everyday activities. Perfect for: Kids who like poetry. 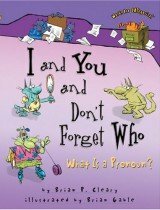 Find I and You and Don’t Forget Who: What Is a Pronoun? at your local library. by: Jon Scieszka, illustrated by: Lane Smith - (Viking, 1998) 80 pages. This installment of the popular Time Warp Trio series is homage to some of the best-ever summer reading lists. Sam, Fred and Joe happen to have in their possession a bona fide time traveling book. When one of the boys absentmindedly puts their summer reading list in the book, they find themselves in the midst of a literary battle of evil against good! Perfect for: Kids who like fantasy. 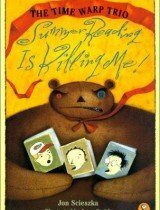 Find Summer Reading is Killing Me at your local library. by: Margaret Peterson Haddix, illustrated by: Mark Elliott - (Simon & Schuster, 2007) 144 pages. Dexter is tough! On the first day of school, he lashes out when he trips and the other kids laugh at him. He punches another kid in the bathroom. But like so many kids with a gruff demeanor, Dexter is acting out because of a painful circumstance at home. He learns to express his emotions because of a gifted teacher and a writing assignment. I can think of no better lesson for a child to learn — feelings come out, one way or another — and finding a healthy way to sort them out is important. Perfect for a third-grader who has been bullied, or who can be too tough with others. Perfect for: Kids who like stories about school. 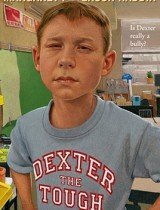 Find Dexter the Tough at your local library. by: Loreen Leedy - (Henry Holt, 2000) 32 pages. Lisa’s class is learning how to make maps in school. For a homework assignment, she decides to make a map of her dog Penny’s world. She includes the places where Penny likes to hide her toys and the best walking routes. This fun story will also help your child learn about the important features of maps. Find Mapping Penny’s World at your local library. by: Francisco Jiménez, illustrated by: Simón Silva - (Houghton Mifflin, 1998) 40 pages. 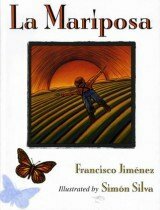 La Mariposa is a beautifully illustrated book about author Francisco Jiménez’s childhood as a member of a Mexican migrant farm family. Young Francisco prepares himself for English-only first grade, without knowing a word of this new language. As the days pass, he becomes more and more uncertain if he will ever learn English, learn to read or find a friend. However, his beautiful drawings of butterflies help him win over the class bully and begin to transcend the barrier of language. Find La Mariposa at your local library. by: Patricia Polacco - (Philomel, 1988) 40 pages. Patricia Polacco describes what it was like to be unable to read in the fifth grade. She was taunted by classmates and plagued with her own self-doubt until a teacher finally recognized that she couldn’t read and gave her the assurance and help she needed to succeed. 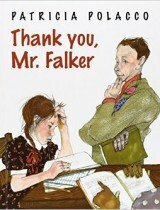 Find Thank You, Mr. Falker at your local library. by: Edward Eager - (Oxford University Press, 1954) 208 pages. 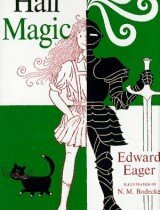 Half Magic was the Magic Tree House of its day. As if wizardry was not enough, our four main characters take on multiple adventures with only “half” the magical prowess they need from a found coin. The kids devise clever ways to utilize the coin’s capacity and the result is a very cool and captivating story. If your child falls in love with Half Magic, there are several sequels to quench their thirst for more. Perfect for: Kids who like classic stories. Find Half Magic at your local library. by: Robert McCloskey - (Puffin, 1943) 160 pages. Homer Price’s six sidesplitting exploits included here will keep your child reading and rolling in the aisles. Author of many wonderful books, including the award-winning Make Way for Ducklings and Blueberries for Sal, Robert McCloskey was truly inspired by his funny bone when he wrote these stories. 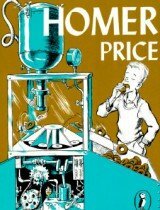 Find Homer Price at your local library. by: J.M. Barrie - (Charles Scribner's Sons, 1911) 240 pages. The hook: The original language is rich, and the story, so much a part of our culture, inspires children to dream. Some of the racial and gender stereotypes, typical for their time, will need explanation. Want to watch the movie? The still-enchanting Disney classic contains some dated stereotypes but may prompt great discussions about how movies have changed since 1953. 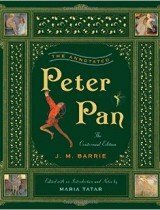 Find Peter Pan at your local library. by: Robert Lawson - (Viking Press, 1944) 128 pages. 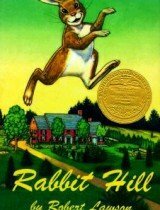 Rabbit Hill is a time-honored book about a family of rabbits and the meaning of community. The characters are the same as they are in any neighborhood; you get a little of everything, both funny and frustrating. The inspired vocabulary makes for a welcome challenge and the environmental element of the story inspires discussion. Perfect for a parent-child book club. Find Rabbit Hill at your local library. 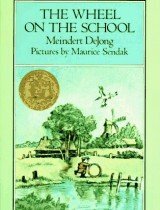 by: Meindert DeJong, illustrated by: Maurice Sendak - (Harper & Bros., 1954) 320 pages. Set in Holland in a tiny fishing village, this is the story of Lina and her classmates. After doing some research for a school report, Lina is determined to lure storks back to their village as they are believed to bring good luck. This book won the 1955 Newbery Award. Find The Wheel on the School at your local library. by: Jeff Smith - (Graphix, 1996) 192 pages. 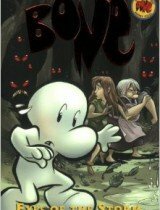 Fone Bone, a fanciful character, hides from the rat creatures with Gran’ma Ben (a former queen) and his human friend, Thorn (who finds out she is a princess). This graphic novel weaves together intrigue and humor. Perfect for: Kids who like fantasy stories. Find Bone #3: Eyes of the Storm at your local library. by: Sharon Creech, illustrated by: David Diaz - (Joanna Cotler Books, 2007)336 pages. This is a clever, fun fairytale with positive messages. There is mild fairytale violence and of course, budding romance. A storyteller tells a story in which parents and siblings die and thieves are killed; the killings are shown as unjust. Families can talk about being grateful and what the characters learned about the responsibilities that come with privilege. Why was the princess so unhappy? Why weren’t riches enough for the royals? How did the peasants feel about the royals once they met them? 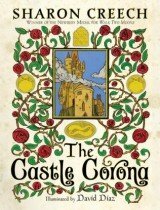 Find The Castle Corona at your local library.